Metropolis is under attack by entities unknown and Superman is utterly helpless to stop, just as he’s unable to stop the massive change in Lois Lane’s life. Action Comics begins its newest arc with a simultaneous bang and whimper, which really shouldn’t be possible, yet somehow this issue is able to pull that off. There are so many ideas present in this issue that are perfect for a Superman comic while also feeling different than most other Superman comics. Those ideas can only take something so far though when the end product feels very jumbled and unfocused. 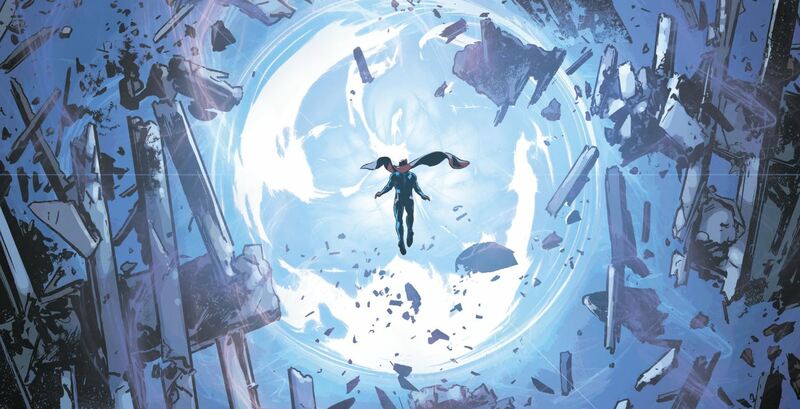 While this is set up for the rest of the arc, and more than likely future arcs, so hopefully the actual storyline itself doesn’t end up being entirely setup and that moving forward, Action Comics will become more focused. As frustrating as this issue was at times, it definitely isn’t without merit. During the end of Bendis’ tenure at Marvel he often fell into the trap of setting up future storylines while also trying to tell his current story. Those stories often ended up feeling very unfocused, much like this issue, but unlike his later Marvel books, Action Comics is presented in more of a mystery type of style rather than “Hey look! Future stories!” That mystery being told is very intriguing and makes you want to keep reading, but the only problem is that there are two separate storylines in this issue that make you feel that way. This issue is simply frustrating because there is so much good in it that it’s hard not to gush about that. Jimmy Olsen is brought to a Cult of Kobra meeting could be a storyline all by itself and so could Superman saving Amanda Waller from falling to death before an enormous explosion. Both are executed very well, but because both are present the issue doesn’t feel balanced in its structure or pacing. The best part of the issue though definitely has to be Lois’ conversation with her father. This is something that probably should’ve been done years ago in the comics, but now that it’s been done, it’s just as satisfying and heartbreaking as one would think it would be. The star of this issue though has to be Steve Epting. Some of Epting’s best work in the best have been his collaborations with Ed Brubaker on books like Captain America and Velvet, which have very similar tones that shouldn’t work in a Superman book, but it works perfectly here. Whether it be the terrifying feeling that the Cult of Kobra creates, Superman’s movement, both casual and powerful, or Lois’ very quiet sadness, his art throughout this issue is spectacular. One of the best thing about Epting’s is art is his ability to create ever so subtle facial expressions. In real life, everyone has these micro-movements that are almost imperceptible, yet Epting somehow is able to do that in his art which makes for so many great emotional moments when he’s able to do it. There’s a lot of good in Action Comics no. 1007, but sadly it also stumbles due to its structure and pacing.